This is our first post of our “Day In The Life” series, in which we interview authors of books released through small or independent publishers. 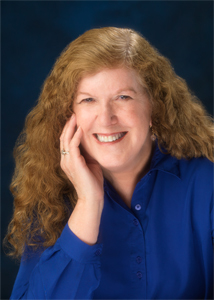 Today, I’m delighted to post my pre-publication interview with Bonnie G. Vaughan, whose novel Spaceborn was released by Black Opal Books last week. Bonnie became fascinated with space travel when the first lunar lander took off from the moon. A journalist and award-winning tech writer, Ms. Vaughan has had many opportunities to tell the stories of others, writing her own science fiction stories on weekends. She received technical advice from Dr. Harrison Schmitt, the geologist who walked on the moon, for Spaceborn. I’ve just finished reading Spaceborn this weekend, and I’m hoping to get a chance to ask Bonnie some follow up questions later this summer. IOB: Will you describe your typical “writing day” for us? When does writing happen? where? How does it get fit in to the rest of life’s activities? Anything else make a part of your “typical” day with writing? BGV: I like to write the first hour of the morning, before work or weekend activities, while my conscious mind is still close to my subconscious. Often I get up as early as 5 a.m. to make time for writing my stories. Research happens mainly on weekends or evenings. IOB: It sounds like a lot of your creative work happens in those morning hours. Does editing happen at those times too? Or does that happen more during research hours? BGV: The editing to me is rewriting, so I usually do that in the morning hour. I’ve learned over the years, though, that I can write almost any time and anywhere—on a baseball field waiting for my son’s game to start, in our Corvette on the way from San Jose to LA, in an airport terminal or a doctor’s waiting room, and in my office all night if I have a deadline. Even 15 minutes is enough to accomplish something. My favorite time and place is early morning with a laptop in my easy chair. IOB: It also sounds as if, like many writers, you spend time balancing your work/family life with your writing life. Do you have advice for other writers on achieving that balance successfully? IOB: On your site (www.bonniegvaughan.com) you mention that you were first intrigued by space travel when the first lunar lander took off from the moon. Was it that event that inspired you to start writing fiction? IOB: I’m really looking forward to Spaceborn and particularly intrigued by the premise: the main character, Morgan Zeller, is pregnant, and her pregnancy a key feature of the novel. How did you come to conceive of (no pun intended) Morgan and her interesting situation? BGV: One day I asked myself, “What if an astronaut discovered she was pregnant on the way to Mars?” The story grew from that. IOB: Any other “what ifs” you’ve had recently that you could share with us? BGV: What if a boy discovers intelligent life on his colony planet and has to expose the planet’s governor for colonizing an inhabited world? What if people establish an independent colony on Mars and the government tries to take away their Martian homes? What if lizard-like visitors are luring people to leave Earth for a colony on Titan, Saturn’s largest moon, and a pregnant engineer learns that her friends are dying in alien mines there? IOB: I’m always impressed at the range of people and resources successful authors find for support. Where do you find your writing support systems? Do you have a writing community or communities that you interact with? BGV: All of my friends and family are supportive, especially my son, Chris Vaughan, who has always encouraged me to write my own stories. My mentor, Bonnie Hearn Hill, and her friends have been my writing community over the last several years. I took several fiction courses from her and like to attend conferences where she is speaking. IOB: What advice would you give to other writers who are working on a first novel? BGV: Read Digital Ink: Writing Killer Fiction in the E-book Age by Bonnie Hearn Hill and Christopher Allan Poe, write every day, read lots of novels, and find a mentor. IOB: What did you find to be the most relaxing part of drafting Spaceborn? The most difficult part of writing a novel? What were the hardest parts of reworking the novel for submission? How do you overcome challenges in the writing and rewriting processes? BGV: The most relaxing part of writing for me is when I start a book and put all of my initial ideas for the story into words. Rather than outline, this first draft is mainly a summary, with some scenes that occurred to me as I was writing it. I let my subconscious produce whatever it wants to get the book started. The most difficult for me is the final rewriting and polishing because I want to fix everything. The hardest part is reworking the beginning to make an agent or editor want to keep reading. When I get stuck, I give myself permission to write garbage, as Natalie Goldberg said, and the words flow again. IOB: I love Natalie Goldberg – I find her so supportive! It sounds like there are a couple of authors who have inspired your work – where else do you find inspiration? BGV: Since the day after I graduated from high school, I’ve been inspired by astronauts, who are my heroes. After grad night at Disneyland, my mother surprised me with a scrapbook full of newspaper clippings about the space program, which she’d been saving for years. Then she made me stay awake to watch astronaut Ed White take the first American spacewalk. I’m also inspired by everything around me–a hummingbird’s flight, the planets and stars in the night sky, they way people interact with each other, sunsets, moonrises, news about space exploration, movies like “Roving Mars” and “Contact,” children laughing and playing, discussions with brilliant engineers, bonds between family members and friends, the variety of life on Earth, and new technologies like the Orion Multi-Purpose Crew Vehicle. IOB: If you could have had any author, living or dead, to help you with the process of editing drafts of this novel, who would it have been? BGV: Other than Bonnie Hearn Hill, I would love to work with the late Anne McCaffrey, who has been my favorite author since I met her in Berkeley, California, where she was on a panel of women writers. I love her Dragonriders of Pern series. IOB: What would you tell other writers about the pros and cons of working with a smaller publishing company? BGV: So far working with Black Opal Books is great. The staff encourages new authors. The editors do excellent work, and they tell me they like Spaceborn. They seem to care about authors. Maybe spending a lot of time on promotion is a con, but I understand authors also do this at large publishing companies. IOB: My mother-in-law was just telling me how shocked she is at how much more publicity work she’s expected to do now than when she published her first book. What sorts of publicity have they encouraged you to pursue? And how do you fit it into your already tough schedule? BGV: They have encouraged me to do blog interviews, press releases, book signings, and other appearances. I do as much as I can and try to fit it in with my other activities, like scheduling a book signing during vacation. The first promotion I did was in February at a National Association of American Pen Women luncheon that I had already planned to attend. For part of the program, the luncheon organizer wanted three members to speak as Pen Women of the past, present, and future, so for a few minutes I spoke as astrogeologist Morgan Zeller, the main character in Spaceborn. IOB: Can readers follow you on Twitter? IOB: Do you have future writing plans, and if so, would you give us a hint about what we might be hearing about you next? BGV: My plans are to write many more novels and short stories. I will be coauthoring a young adult science fiction book with my son, Chris. I have also started two other books, one science fiction and the other set in the 1950’s. I am also doing research for the sequel to Spaceborn. As part of the research, I’m going to the Mars Society international convention August 15-18 at the University of Colorado, Boulder. IOB: Wow! Sounds like you’re busy, which makes me doubly appreciative of the time you’ve given me and inourbooks.com readers. Thanks again, Bonnie, and best wishes for the success of Spaceborn! BGV: Thank you, Ina, for the opportunity to talk to you and your readers. This entry was posted in Connections, Day In The Life, ina says by ina. Bookmark the permalink. What a wonderful and insightful interview, Bonnie. Congrats, and good luck with your writing!! Thanks, Cathrina. I feel lucky to have so much support from other authors. Great interview, Bonnie. How interesting all the cool people you’ve met and helped with Spaceborn. It sounds like a great read. Good luck. Thank you, Debbie. I’ve met more cool people while the book was being published. Great interview, Bonnie. I wish you much success with your novel, which sounds like a fantastic read. I am a great fan of everthing extraterrestrial, so I’m looking forward to your book. Thanks, Aneta. Meeting an extraterrestrial would be almost as exciting as publishing a novel. Hope you enjoy reading it. Enjoyed your interview, Bonnie. Good luck with your book. Thank you for your support, Zrinka. Thanks for the plug, Bonnie. You know how much I love your writing. Can’t wait to read what you and your Chris create together. This is just the beginning for you. This is a wonderful interview. I now understand how you were able to tap into that character with such conviction. I love your writing, too, Bonnie. You showed me how to write stories. Thank you for helping me get started. Great interview Bonnie. I love your enthusiasm for space travel. Thanks, Marie. It’s exciting to witness our first journeys into space.